Supporting local landlords and events venues to organise activities to raise funds for Peace in the Park and promote peace, understanding and social justice. Pub quiz for peace – run a quiz night, with entry fees going to Peace in the Park. You could even set peace themed questions to drop in to the quiz. 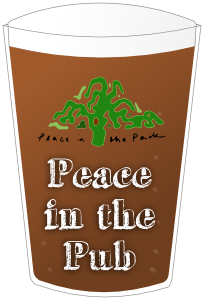 Ale for peace – do you have contacts with a local brewery, could they produce a Peace in the Park ale. Pennies for peace – keep a collection tin on the bar for loose change to be donated to Peace in the Park. Tell us about your event or activity and we will advertise them via all of our social media streams giving you access to new audiences. The festival has an extensive online following as well as a radio show and an engaged city wide audience. We can provide information for your staff to understand the benefits of raising money for Peace in the Park, and why your customers should support the cause. For regular event holders, our volunteers can help with the collection of any donations.